The Peekskill meteorite has offered a rare and unique window for scientific investigation largely due to the video footage of its descent. As a result, several scientific investigations have been able to track the meteorite's flight path to Earth— including its orbit around the Sun. 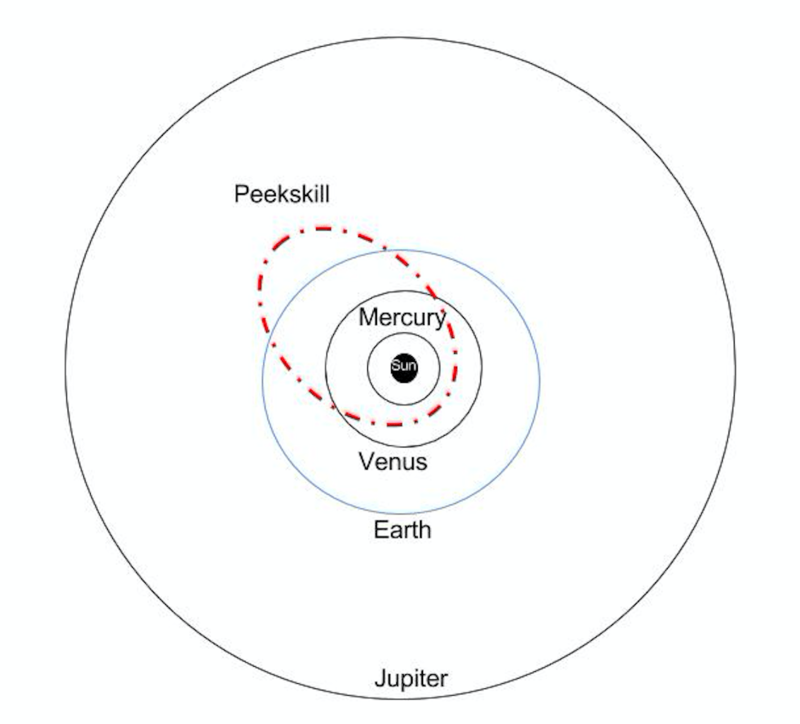 The Peekskill meteorite originated from the asteroid belt (between Jupiter and Mars) and is approximately 4.4 billion years old. It has been classified as an "H6 Chondrite” which is to say it contains chondrules, spherules of silica, which formed at the beginning of the formation of our solar system. The “H” means that it has a higher than normal content of free iron (approximately 20% by mass) which is scattered throughout the matrix in the form of tiny metallic flakes. The “6”, which is on a scale of 1-7, represents that this meteorite metamorphosed sufficiently in interplanetary space to homogenize previously well-defined mineral compositions and obscure the outlines of most chondrules. The orbit and atmospheric trajectory of the Peekskill meteorite from video records. P. Brown, Z. Ceplecha, R. L. Hawkes, G. Wetherill, M. Beech, K. Mossman. From Nature vol. 367, February 17, 1994. Exposure history of the Peekskill (H6) meteorite. Th. Graf, K. Marti, S. Xue, G.G. Herzog, J. Klein, R. Middleton, K. Metzler, R. Herd, P. Brown, J.F. Wacker, A. J. T. Jull, J. Masarik, V. T. Koslowsky, H. R. Andrews, R. J. J. Cornett, W. G. Davies, B. F. Greiner, Y. Imahori, J. W. McKay, G. M. Milton, and J. C. D. Milton. From Meteorites and Planetary Science 32, 25-30, 1997.